CFSC has long standing partnerships building peace at the grassroots in DR Congo, Burundi, and elsewhere in the African Great Lakes region. This work involves many elements of peacebuilding, but has focused especially on personal transformation encounters. This is compassion-based work, to change hearts, promote healing, and rebuild shattered communities and relationships. 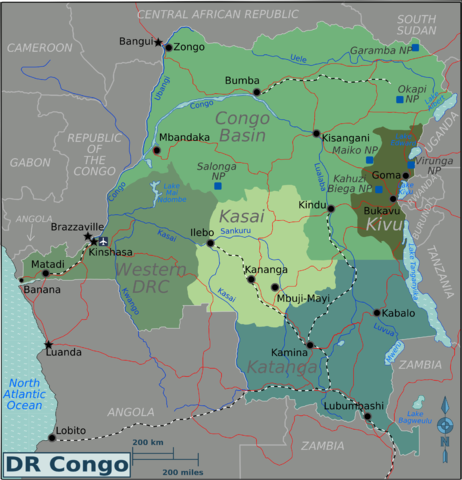 “Muinda” comes from the word for “Light” in several of the languages of Kinshasa – a bustling city of over 9 million, located in the western DRC. Project Muinda has grown from the light of hope in each of its members, who are all Congolese determined that their city and their country can be a peaceful home. In a place where local and international political and commercial interests have acted to aggravate conflict and increase poverty for generations, they have taken every opportunity to learn how to build peace and to share these skills. 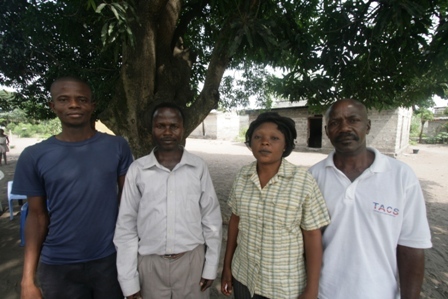 Muinda is a project of Kinshasa Monthly Meeting, a small unprogrammed Quaker Meeting isolated from other Congolese Quakers who are all in the east of the country. 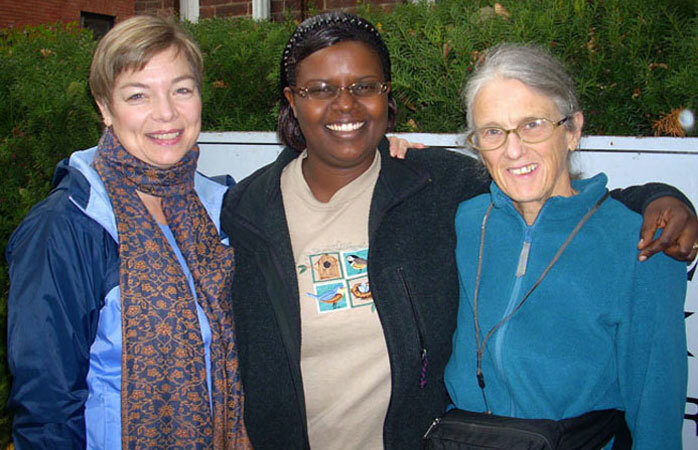 By a series of chances, Ottawa Friends discovered Project Muinda in 1996, and recommended to CFSC that we support Muinda’s work in training community volunteers to lead in local conflict resolution. What is a peace cell? When conflicts arise (typically domestic disputes or landlord-tenant disputes), people know to seek out the assistance of their neighbourhood peace cell. Peace cells also animate their communities to find collective solutions to problems they have in common. 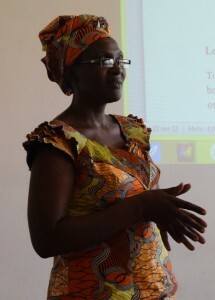 The community-based connections of the network, as well as the members’ peacebuilding skills, make it a strong vehicle for public education on any topic, such as election participation and observation. The peace cells operate with the permission of the municipal authorities and have appropriate working relationships with them. Read a May 2014 article Building a culture of peace in Kinshasa that describes the work of the peace cells as witnessed by CFSC during a visit. Read other descriptions of peace cell activities: In Lemba neighbourhood, where teenagers disbanded hostile groups. In Ngaliema neighbourhood, where a soccer tournament was organized. In the DRC encouraging democratic participation in important. Project Muinda recognizes elections as an excellent “teachable moment”. The peace cell network contributes by providing: (a) non-partisan observers making regular reports, and (b) mediation teams that can de-escalate minor conflicts that may arise. For a country the size of DR Congo, there can never be enough international observers to cover polling stations and ensure that there are no pockets of malpractice. Also, the dedication of local people to election monitoring creates a sense of responsibility for governance, showing political candidates and electoral officials that their own people are watching them. The very act of maintaining an impartial, balanced attitude is an important element of peacebuilding, and is a skill that has to be learned, not taken for granted. Election observation offers an opportunity to help people develop this skill in a very practical setting. It also provides a timely context for people to learn about their human rights and appropriate expectations for good governance. For more on election monitoring see November 2011 D. R. Congo election observer team reports and Joint Press Release on Conglese Election from Development and Peace, Entraide missionnaire inc. and CFSC. In the late 90s, in an extremely tense political environment, Friends in Burundi and Rwanda asked their leaders to work with Friends worldwide to find ways to break the cycle of violence. Connections began to develop around the concept of trauma healing. One of the directions taken, supported by African Great Lakes Initiative of Friends Peace Teams (AGLI) was to bring formerly conflicted groups together in workshops. At their best, these workshops can develop a sense of shared humanity, heal wounds, and change hearts. Modeled after Alternatives to Violence (AVP), the focus is on acknowledging and healing trauma. The workshops, called Healing and Rebuilding Our Communities (HROC), have been supported by CFSC for years. We heard about the healing work she does with people who were either victims or perpetrators of brutal killings during the Rwandan genocide. It was hard to comprehend the horror her friends, family, and neighbours had gone through, but it was even more difficult to accept that the two sides could come together in true forgiveness and reconciliation. Truly, the work that Florence does, and the vision and dedication of all the people who make up HROC, are reasons to rejoice. What an inspiration! Part of our commitment to building peace is seeing that the conditions are in place for people and communities to thrive. For this reason CFSC supports Friends Women’s Association in Bujumbura, Burundi. They deliver health and rights trainings and health services at a clinic focused specifically on sexual and reproductive health needs and HIV/AIDS diagnosis and care. The idea appears to have been originated by Pierre Ceresole, a Swiss who later joined the Society of Friends. Having observed the reconstruction work of the Friends’ units in France during World War I, Ceresole felt that it would be a step towards peace if young people from many countries had an opportunity to know each other through the comradeship of shared constructive, voluntary service. Eventually Ceresole founded the Service Civile Internationale, which , in turn, inspired the development of the American Friends Service Committee‘s work-camp programme in the United States, beginning in 1934. Learn more about service opportunities in Canada and internationally. Find peace resources and learn more about CFSC’s thinking and actions around peacebuilding.